Eden Hazard has travelled with Chelsea for Thursday's Europa League game with BATE Borisov but Marcos Alonso, David Luiz, Antonio Rudiger and Alvaro Morata have been left at home. 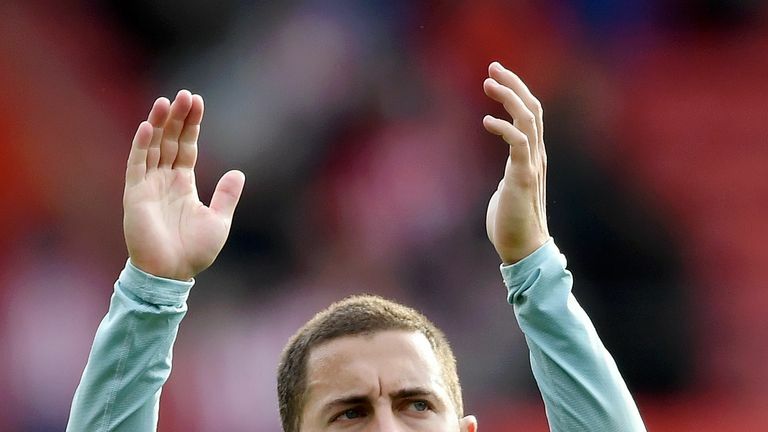 Hazard missed three matches with a back problem before returning as a substitute in Sunday's Premier League win over Crystal Palace, but has made the journey to Belarus for the Group L fixture at Borisov Arena. "For our doctor, there is not any risk, otherwise he would stay in Cobham, of course," said Chelsea head coach Maurizio Sarri after the squad arrived in Minsk. "We thought for him it's better to play, not for 90 minutes, but to play after two weeks without training. "In the last match he played only for 30 minutes. Tomorrow [Thursday] the best for him is he will play 45, 50 minutes." "He played for three matches in a row," said the Italian. "I thought it was better for him to stay at Cobham and rest and have only training." Cesc Fabregas was a late withdrawal through illness, resulting in N'Golo Kante travelling. Chelsea will be confirmed in first place with two rounds of matches to go if they win and the other game, between Vidi and PAOK in Budapest, is drawn. Midfielder Mateo Kovacic is cautioning against complacency, though, after watching Liverpool fall to defeat at Red Star Belgrade in the Champions League on Tuesday night. "I watched the game, Liverpool struggled a lot," the on-loan Real Madrid midfielder said. "In Belgrade, the atmosphere is tough. It's difficult to play there, like here. These are games where you need to concentrate a lot or you will lose the game. "The most important thing is we need to be prepared so that what happened to Liverpool doesn't happen to us."